Over the past few years, the craft beer industry has experienced a surge in popularity. According to the Brewers Association, craft breweries grew by 18% through June of 2014, and continued to enjoy double-digit growth through the rest of the year. Craft breweries are opening at a rate of approximately 1.5 per day. In fact, most Americans live within 10 miles of a craft brewery. What makes craft beer different? Small, independent and traditional brewers typically produce craft beer. A craft brewer produces fewer than 6 million barrels of beer each year, and less than 25% of the craft brewery is owned or controlled by someone who is not a craft brewer themself. It has either an all malt flagship, or it manufactures at least 50% of its beers with traditional or innovative brewing ingredients. Because of their size, passion, and community involvement, craft breweries have a unique, distinctive approach to connecting with their consumers. The result? A beer that is unique, robust and innovative. According to data supplied by the Brewers Association, 38% of American households bought craft beer in 2014, and 32% of that beer was consumed by women. With craft beer appealing to many different demographics, it’s no surprise that numerous trends should begin to surface across the country. While cans have long been used for the packaging of domestic and imported beer, more craft breweries have recently begun canning their beers as well. The reasons are simple: canned beers have less exposure to light and any potential oxidation and will typically stay fresher longer. Essentially, canned beer is like a ‘mini’ keg of beer and it will taste most similarly to the draught version it was born from, designed specifically by each unique brewer. Beer cans are also lighter and therefore traditionally less expensive to ship. Cans go places where bottled beer cannot, therefore cans are a natural fit for golf courses, patios, pools, ballparks, etc. Additionally, cans are easily recycled, making them an eco-friendly option. Craft beers generally have a higher alcohol content than other beers, and many beer enthusiasts enjoy them for this reason. However, for those who enjoy beer but not an increased alcohol content, session craft beers are a fantastic option. With less than 5% ABV, session beers are ideal for those who want to enjoy craft beers in quantity. Because the market has begun to demand more session beers, more craft breweries now manufacture them, giving an abundance of options to choose from. To ensure a sufficiently bubbly beer, most breweries either add carbon dioxide to their brews before packaging them, or preserve the carbon dioxide that occurs naturally from the yeast. Cask-conditioned craft beer has the same beginning process as traditional beer, but its fermentation and conditioning process has been completed in a metal or wooden cask. This process leaves the beer unfiltered and doesn’t add carbon dioxide, rendering a beer that is smooth, slightly cloudy, and unique. A recent trend in craft beer has seen sour beer win the hearts of brew enthusiasts. Sour beers are produced when a strain of wild yeast or bacteria are introduced into the beer. Sour craft beers are difficult to make and even more difficult to control, so mastering the art is challenging. While a few established breweries manufacture one or two sour beers, it is still very rare to find in stores or at bars. 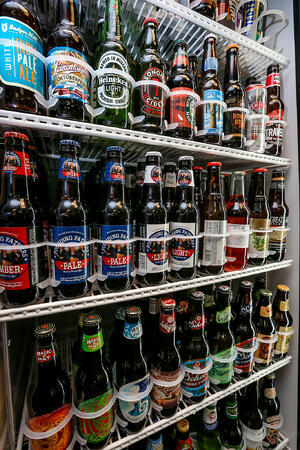 Craft beers offer a great deal of diversity, which is one of the reasons they have experienced a boom in popularity. With all the varieties available, you are sure to find one that appeals to you.